Soft adventure in Virginia’s Blue Ridge Mountains. 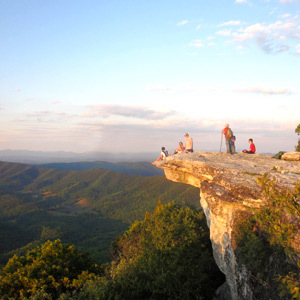 Virginia’s Shenandoah National Park is lovely, easily accessible, and kid-friendly. Drive the scenic and slow Skyline Drive, stopping for family photos above vast landscapes of America’s oldest mountains, brilliant red and gold in the fall. Stop into the delightful wooden house on Sperryville’s Main Street for a Sunday brunch of mushroom crêpes or French toast. The old-fashioned mountain camp has rustic wood-paneled rooms and a playground for kids. Park and walk this 1.8-mile round trip path, a wildlife-rich hike with educational signs along the way.